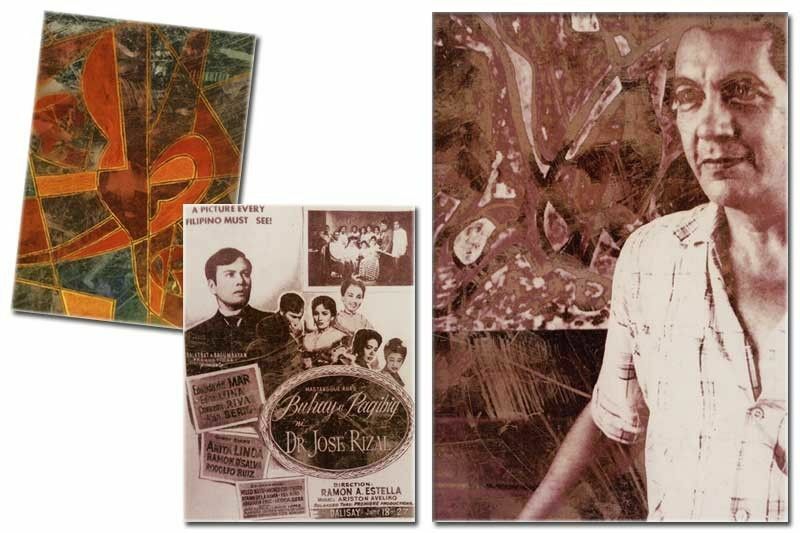 From Left: One of his abstract paintings, Ad of Buhay at Pag-ibig ni Dr. Jose Rizal and Director-painter Ramon Estella. As filmmaker, Ramon Estella was acclaimed. In the late ’30s, ’40s and ’50s, he directed such important films as Buenavista, Huling Habilin, Voice of Freedom, Sundalong Talahib, Desperado and Buhay at Pag-ibig ni Dr. Jose Rizal. Buenavista merited Estella the Director of the Year (1941) award from the Philippine Cinema and Radio. Rosa del Rosario was named Actress of the Year for the same film. Desperado was FAMAS Best Picture, Editor and Director for 1956. Buhay at Pag-ibig ni Dr. Jose Rizal is a three-hour epic which depicted major events in the life of the National Hero, shown in 1956. But as a painter, little is written about Estella, although his exhibits were acclaimed here and abroad, including the United States. Estella was described as purveyor of modern art, culture and antiquities. In the late ’50s, Estella left for New York to study film and television courses under top directors. He also worked for the United Nations and directed documentaries, TV shows and newsreels. His UN job brought him to Latin America and some parts of Asia, among them Singapore and Malaya. His last visit to the Philippines was in 1981 during the Manila International Film Festival, where he had a grand reunion with his colleagues. In the ’50s, Estella was at par with Gerry de Leon, Bert Avellana and Manuel Conde, dubbed the four “wonderboys” of local cinema. Estella spent the last years of his life in Florida with his Japanese wife. He died on May 4, 1991 of cancer of the liver.